It's officially SPRING in Australia!!! WOOT!! I just love Spring as it's not too hot and not too cold - perfect for my temperamental skin. It also means bright colours, pastels, pretty dresses and pretty heels!! I don't really follow seasons when it comes to my manicures (I wear brights in Winter and dark colours in Summer!) but the start of Spring calls for pastel polishes to be broken out. Not like I EVER need any excuse to haha. 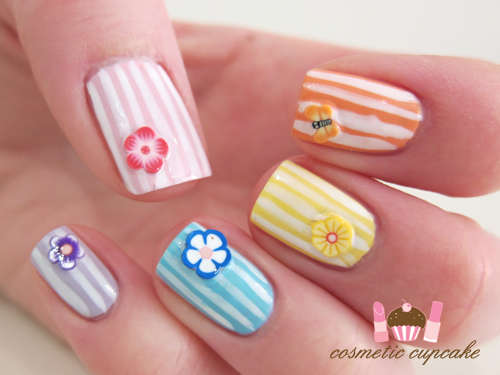 Here's my striped Spring manicure to get you in the mood for warmer weather!! For my pinkys, I used 2 coats of China Glaze Light As Air; for ring fingers I used 3 coats of OPI What's with the Cattitude; for middle fingers I used 2 coats of China Glaze Lemon Fizz; for index fingers I used 2 coats of China Glaze Peachy Keen and thumbs I used 2 coats of China Glaze Something Sweet. PHEW!! I then used Kiss nail art striper in white to draw about 4- 5 vertical lines on each nail and added a corresponding coloured fimo slice. You can check out my fimo tutorial here. If you'd like to find out how I achieved this look, you can check out my step by step tutorial for this manicure which I did as part of the 2threads Dove Diaries campaign as their featured beauty blogger this week! What's your must have colour for Spring this year? Thanks for looking as always ladies!! =) Have a wonderful weekend! This is SO cute! And I want to move to Australia where it's springtime. Not so glad that it's fall here in the US. Very nice manicure! What an eye catching manicure!! I seriously love it and cannot stop staring!! thumb print is so pretty!!! 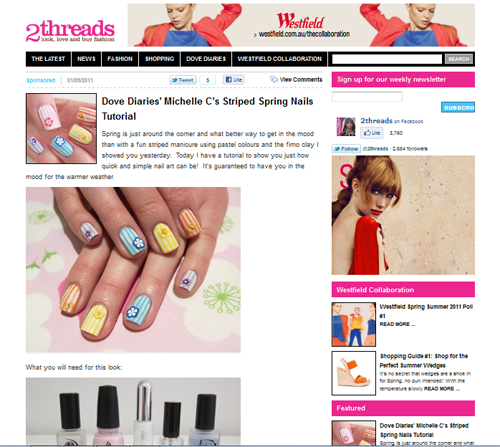 Hi Chelle, your nails are super cute for spring. Unfortunately it's fall for us in Canada now. For spring I like pastel colors, but I can only wear the ones with a little bit of a shimmer finish vs creme. For fall I like cranbery and dark earthy green and blues. No griege for me because it washes me out too much. Thanks for sharing this fun spring look. This is so cute ! I have to try it ! Beautiful! One of my good friends was recently in Australia and everyone apparently thought she was nuts walking around in shorts and a tank top, lol! I guess your winter is a bit warmer than our (Canadian) summer! 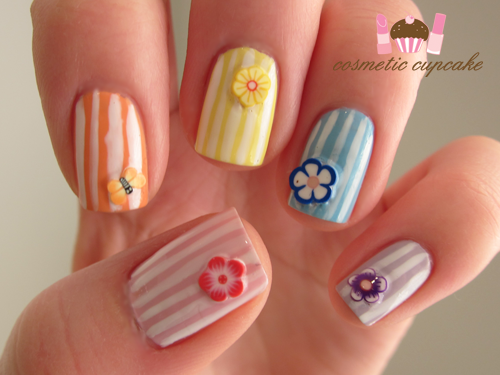 Great manicure, love the colours! Congrats on the 2threads feature as well lady!! Love the colors you chose :) Crazy how you guys are just starting spring over there! I really like this mani. I wish it was spring here, I am so sick of 100+ weather. This is freakin' adorable! As one of your neighbours across the ditch, I have to say I'm pretty stoked that it's finally spring!! There is only one thing to say - this is all kinds of adorable!